One of Library Journal’s “Thirty Amazing Poetry Titles for Spring 2014,” The Keys to the Jail asks the question of who is to blame for all we’ve lost, calling us to reexamine the harsh words of failed love, the aging of a once-beautiful body, even our own voracious desires. With daring leaps and unflinching observations, these richly textured lyrics travel from Montana’s great wildernesses to the ocean-fogged streets of San Francisco as they search out the heart that’s lost its way. In these poems, longing is only shaped like emptiness, but really is filled with everything one might reach toward or put their mouth to as they sate themselves on desire. THE KEYS TO THE JAIL are what they promise to be, an opening of the dark rooms within us, not to escape but to enter, to let the eyes adjust and learn to see what bright wants exist there. Quietly ferocious, THE KEYS TO THE JAIL is full of love and after-love poems that come clad with ‘bell[ies] of rusted steel.’ These poems are not afraid to feel, not afraid of desire or beauty or the inevitability of their respective undoings, not afraid ‘to eat the filter on the cigarette.’ Yet there is such generosity here in the ‘repenned’ landscape—out among the wolves and ghosts, the rodeo queens and Dairy Queens—that we are allowed to glean from hunger, a form of contentment, and still welcome the cavernous desire for more. Kuipers is a keeper… Readers will feel the impassioned yet controlled energy that is lifted from these poems; fearless and possessing a precise sense of timing, ­Kuipers’ work keeps us reading. I know few contemporary poets who answer apathy with an unabashed expression of joy. 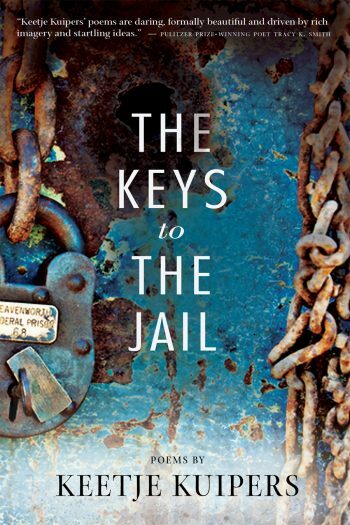 Because throughout THE KEYS TO THE JAIL, Kuipers—for better or worse—privileges feeling above all else, the speaker's ability to honor the ordinary world and its cyclical plots as purposeful and joy-filled is convincing. For Kuipers, it's feeling that unlocks the cells that contain us. Lows and highs are of equal value, so long as they are acknowledged, fully felt, and accounted for. As a whole, the poems in THE KEYS TO THE JAIL are bittersweet and tenderly defiant. As art, these poems both estrange and fulfill us. They leave us aching with the desire to overcome the want and sadness of the darker aspects of existence.